"To the Writer of this letter, and to all those read this Article. The Policy, regarding Hoods, has been examined, and has been removed. I would like to explain that this Policy was in effect for several years, and started when there was a serious issue of Robberies in Peterborough Square. Regarding the other Occurrences that were listed in this letter, unfortunately without dates and times, I cannot investigate these incidences much further. I can assure you all that, when it comes to handling certain individuals and situations, that our Security Team strive to act with utmost Professionalism. We are held accountable for everything that we do, and although the Property is of Private Ownership, we are still Public Figures, in the Public's Eye. Again, I apologize to the Writer of this Letter, for experiencing these misunderstandings. 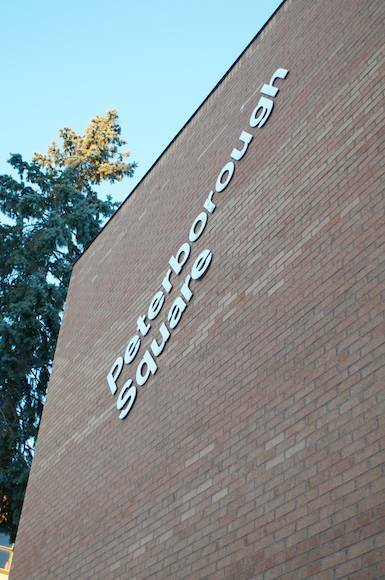 They are more than welcome to contact us at Peterborough Square, as is the rest of the Public, at any time, if they have any questions or concerns. 1-705-742-0493. Thank you for bringing this to our attention and thank you to PTBO CANADA for posting this article. Hey all, I just wanted to write in and find out if you have heard any complaints about the PTBO Square mall security. I have been a patron at the mall since the 90s. I have never had a problem until recent years. The security there seems to have a problem with harassing people for the way they dress, specifically wearing hoods. I myself have become one of the people harassed. Basically, I was told to remove my hood or be removed and banned from the mall. I was sitting quietly with my Girlfriend (who attends Trillium college) as we have done for the last 6 months, this time near an exit. As it was fairly cold, I left the hood on my sweater up to help stay warm (I should also mention I was in bad health at the time). One of the guards there came out of nowhere and demanded I remove as per mall rules, the reason she gave me, was that people who have previously been banned from the mall try to conceal their identity to enter. I showed her who I was, that I am not one of the people who have been banned and tried to explain the reason for wearing the hood, but she wouldn't give me a chance to speak and threatened to have me removed and banned. I even tried to ask to see the list of mall regulations and asked why nothing is posted stating that hoods are banned and the guard again threatened to remove me then walked away. This was a nice encounter compared to the others I have watched. During my 6 months of spending an hour a day there for dinner with my Girlfriend I have seen the guards there pick on certain people with absolutely no justification. A young couple (looking like high schoolers) waiting for a job interview downstairs were escorted out of the mall for being "disturbing to patrons" even though they were quiet and sat on a bench near the back entrance downstairs away from most businesses (I had been in the same area for about ten minutes waiting for my girlfriend to get out of class and not once did I even hear a raised voice from them), a friends mother was physically detained, banned and then fined for a completely false matter, which seemed to be a huge misunderstanding of a mental disorder she has. There are several people I know and have seen harassed for hoods and hats being worn, when there are clearly other people in the mall with the same attire, but last night I got a message that basically put me over the edge. My girlfriend was sitting for lunch on her own and watched a male guard harassing a KID who was OUTSIDE of the mall, demanding the kid take off his hood. The kid tried to explain that he was cold and didn't feel it right to have to remove his hood. The guard continued to yell at the kid, who in turn finally yelled back and accused the guard of harassment. I have tried talking to local police about the matter, and have had no help at all. No replies from Lawyers in the area, and online help is hard to find at all. I feel very strongly that this should be dealt with but have no official help. I know that there has NEVER been a posting about any sort of clothing being banned from the mall, the mall staff that I have been able to speak with have all but refused any documentation to show this rule, and the harassing and bullying still continues. Eventually this is going to get out of hand and I can see the guards picking on the wrong person and ending up with a bad situation on their hands. I had posted something about it on a social site I am a part of, and have had a lot of feedback from current and past residents who have had the same experiences and most have actually stopped going to that mall for that reason, and soon I too will no longer shop at that mall, and after almost 20 years of going there, I can honestly say that makes me disappointed. That mall will end up worse off then Portage mall if it doesn't change. Whether its making sure the guards are not overstepping their boundaries, or even the simple act of putting up signs to notify people of the rules of the mall, anything helps. Thanks for taking the time to read this (if you made it through lol), I know its a bit of a rant, but, it all needs to be said. Anyone else experienced anything similar? Or something to the contrary? What have your experience(s) been like at the mall? Tip us or comment below.